Idea Cellular today announced the launch of India’s first ‘Language Helpline’ a complete out of the box innovative value added service which will offer conversational support to callers, in as many as 16 languages. 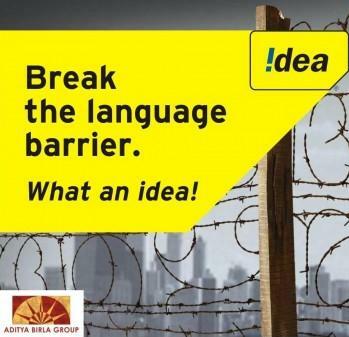 Now any of the mobile users in the country who have to move out of their homes for Career, Education, Travel and other prospects in life; or need to communicate with people talking different languages in their own surroundings, can now avail this unique service from Idea. So how does this Language helpline works ? For instance, a Bengali speaking person who needs to have a conversation in Marathi, with a vegetable vendor or a cab-driver in Mumbai, can just dial 9702012345 and seek assistance on Marathi. The caller needs to verbalise his message and the same will be translated by the Idea Helpline agent, instantly on the phone. Input to the agent needs to be given in Hindi or English only for translation in the desired local language. Callers can call any of the 22 customer care helplines of Idea from anywhere in the country, to get assistance on the language spoken in the circle where the call is being made.A nominal charge of 50 paisa per 3minute will be applicable for calling the Language Helpline. Idea’s Language Helpline is available across all 22 telecom circles and in 16 Indian languages – Assamese, Bengali, Bhojpuri, English, Gujarati, Hindi, Kannada, Kashmiri, Malayalam, Marathi, Tamil, Telugu, Oriya, Punjabi, Rajasthani and Urdu. Language assistance will be offered on the most spoken language(s) in the circle. The helpline number is the Idea customer care number of that circle and can be accessed by Idea subscribers as well as any other mobile user. Pls Disconnect My (IDEA)Mobile Service due to inproper servicing from ur idea Connection & idea customer care. 2)i was put Rs. 67.00/- Idea Message officer on 09/05/2011,evening 8:30pm. (immediately i gotted Message Offer Balance ). 36 messages sent by Groups contacts. here ammount dedected from Main Balance( 1 ). So, Pls Reimbursement my ammount or disconnect My Mobile (Idea) Service.